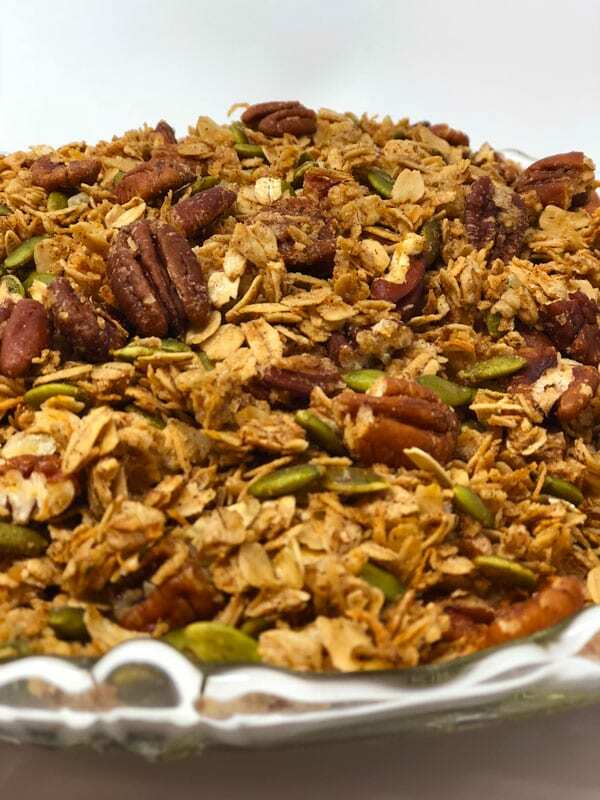 Easy and Healthy Pumpkin Spice Granola is a recipe post by contributing author Kelly Sullivan. I’ve been talking forever to my mother in law about making granola. Granola is one of my weaknesses so I try not to have it laying around or I know I will eat every bit I can get my hands on! There is just something about that salty sweet combination that get me every time!! 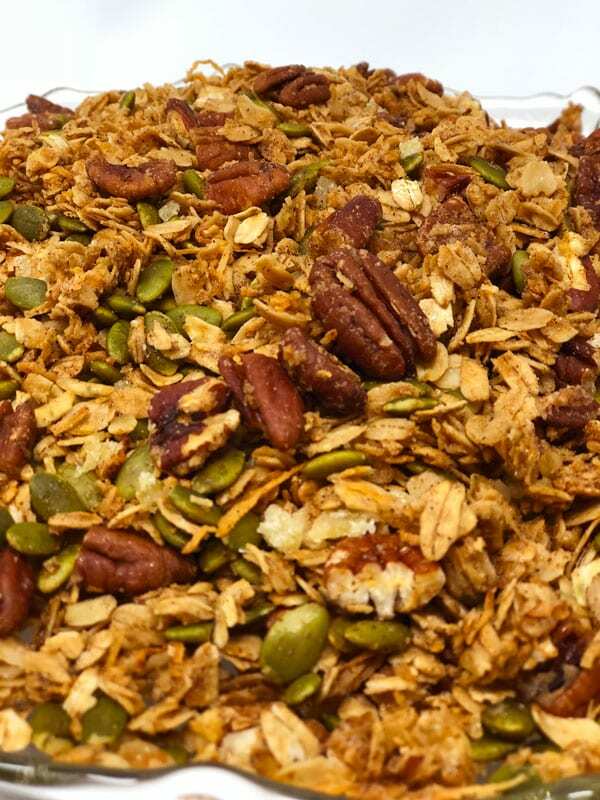 With that being said, “Easy and Healthy Pumpkin Spice Granola” is my favorite granola, by far! And since it’s almost fall and raining out, I decided to throw this recipe together. And who doesn’t like pumpkin in the Fall, right? 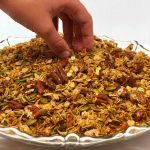 Making this Easy and Healthy Pumpkin Spice Granola couldn’t be easier! You basically throw it all together, spread it out over 2 baking sheets and viola! The hard part is knowing when to take it out of the oven. 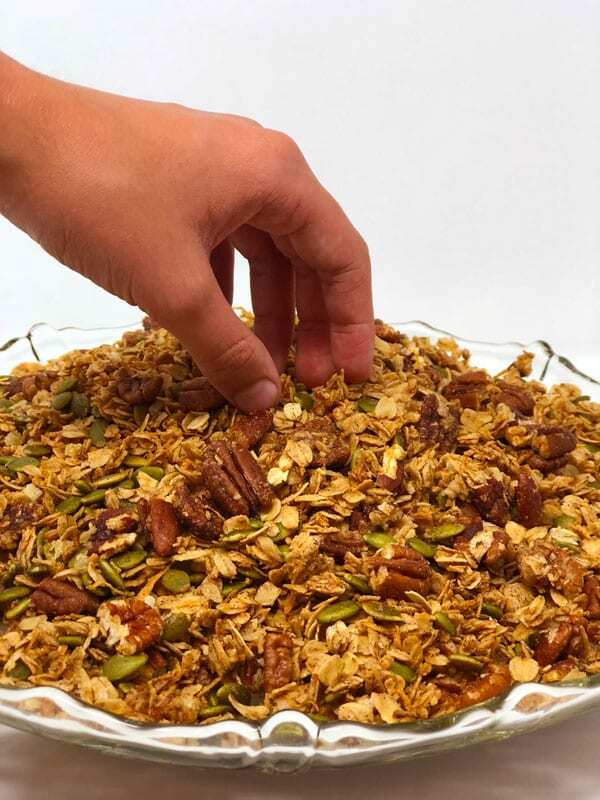 How do I gauge when my granola is ready? Really, there are two things that let me know when it’s ready! The smell and whether or not it sounds “dry” when I stir it. Generally, I stir my granola half way through the cooking time then I don’t mess with it again. When you stir it half way through it really doesn’t make a sound, just kind of scoots around on the pan, but go back 30 minutes later and stir it and it makes this scrape on the bottom of the cookie sheet and that golden hue on top!! Oh my! I think I will need a cup of coffee with this granola! There are two ingredients in this recipe that make it special for me. My friend, Sara, her parents have a farm in upstate New York and harvest and make their own maple syrup!!! I only have a little bit left, so I may be able to make a few more batches with it. And the other ingredient that makes this recipe special is the salt that I used. I used Fleur de Sel salt (this is just optional, you can use any salt you want). My in-laws brought it back to me when they went to France. I hope this Easy and Healthy Pumpkin Spice Granola makes you as happy as it makes me! Talk to y’all next month!! Read more about Kelly on our Meet the Team page. 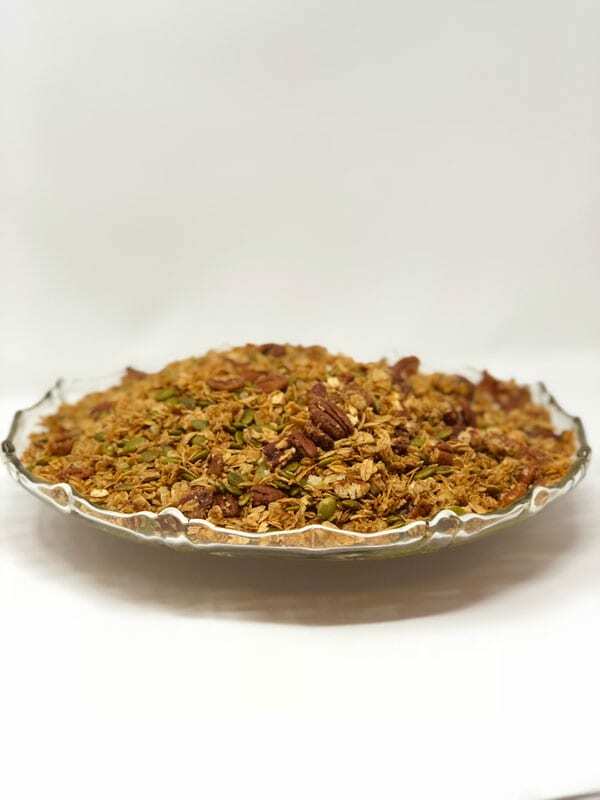 All the flavors of FALL are in this delicious Pumpkin Spice Granola recipe! In a large bowl combine the first 6 ingredients. 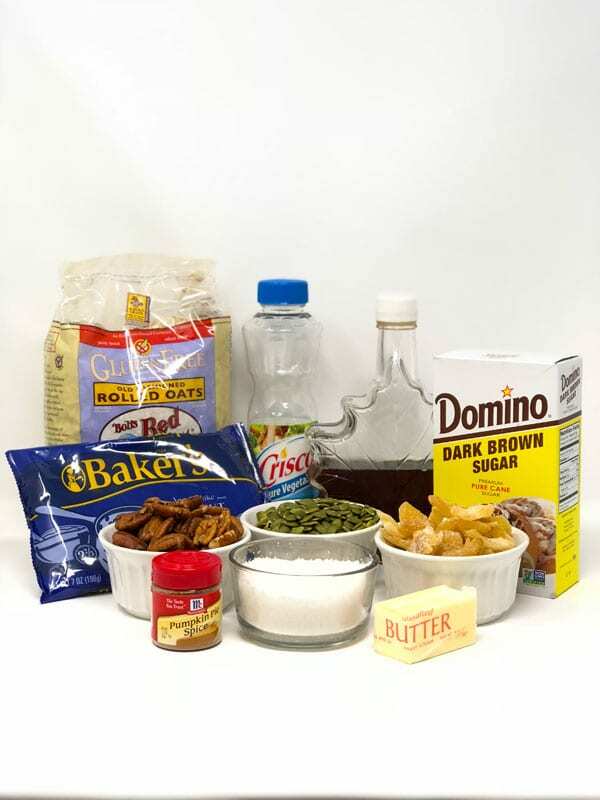 Using a measuring cup or small bowl combine the oil and maple sugar. Pour over the dry ingredients and mix well. Sprinkle pumpkin pie spice all over the ingredients and combine well. Finely chop crystallized ginger and set aside (add to the granola immediately after baking). Bake for 1 hour or until desire color. 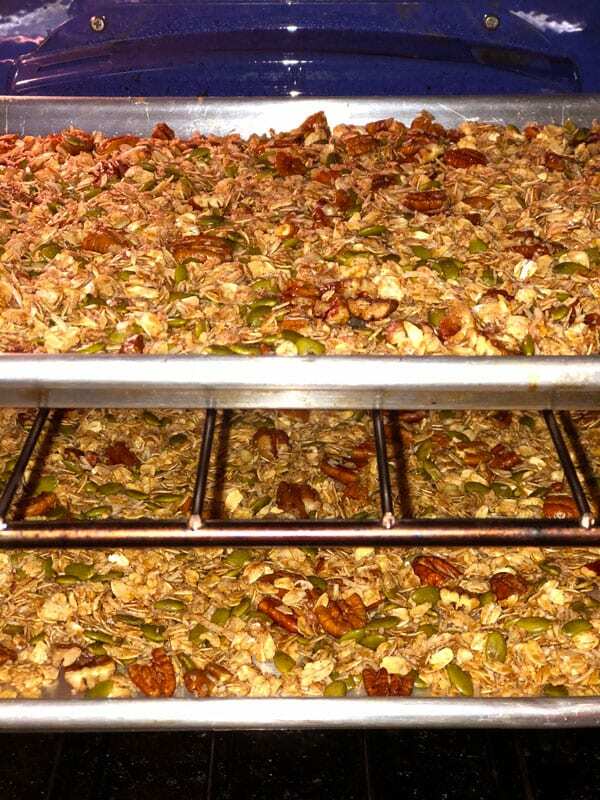 Remember that the granola will continue to cook once it is removed from the oven because of the heat of the pan.